Cleveland Cavaliers 2016 National Basketball Gemstone Championship RingThe 2016 NBA Finals was the c..
2016 Pittsburgh Penguins Stanley Cup Ice Hockey Championship RingThe 2016 Stanley Cup Finals was the..
Denver Broncos 2015 Super Bowl 50 Football Championship RingThe 2015 Denver Broncos season was the f..
Championshipringforsale.com is a professional ring jeweley factory of creating sports championship rings, class rings, high school rings, college rings, military rings, player careers rings and other personalized rings. 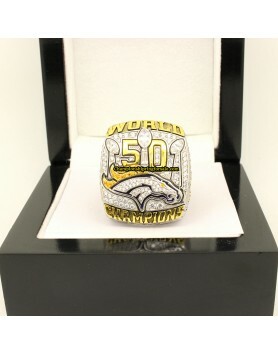 Though in a way we can create any unique ring for you, we focus on Super Bowl championship rings, NBA championship rings, Stanley cup championship rings, World Series championship rings, NCAA championship rings with excellent quality and customer service for a long time. Your championship ring will be made of high quality precious metals and beautiful stones that truly shine. our works with some of the finest jewelers in the field to create beautiful unique rings that will hold the key to great memories and be the source of pride for a lifetime. 1:1 re-produce of the original rings. Deeply engraving with 3D design letters. Custom Name or Number on ring shank is available. Ring inside engraving is available. We sincerely look forward to hearing your story and helping you celebrate like a Legend. We can customize your name and number on the ring shank. Please add the customization requiements with order and add to cart. If you would like to add Letters on inside of the ring, please write down the engrave details on "Inside Engraving" on blank and add to cart. All of our ring will come with a wooden ring gift box, which speical custom-made for championship rings.